Cost: $140 plus $50 materials fee (includes detailed handout, 16g. pack of fine silver metal clay, use of tool kits and equipment). Come explore the wonders of precious metal clay in this introductory one day class. 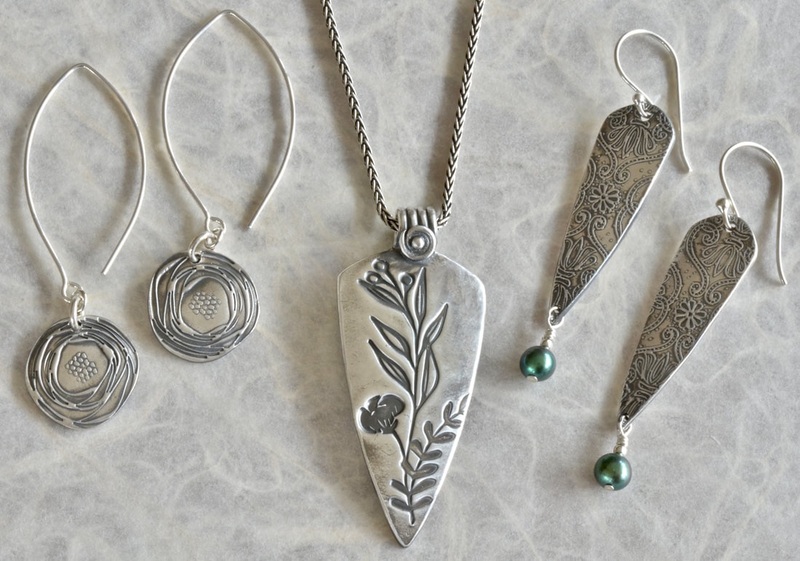 You will create a pendant and/or a pair of earrings from start to finish out of fine silver metal clay. You will learn how to work and handle metal clay, cut it, shape it, add texture, kiln fire, patina, burnish and polish your piece. Extra embellishments and findings such as pearls, stick pins, beads, ear wires and chain will be available for purchase from the instructor and are not included in the materials fee. Complete registration by clicking on the link below, click on "Workshops", then "Jewelry Design with Monique Perry" in the drop down menu. In this one day workshop, you will learn how to prepare the metal to be enameled. Learn to sift and fuse opaque and transparent enamel (powdered glass) to the prepared Copper. You will explore the use of stencils to create patterns on your piece, and learn how to incorporate fine silver foil cuts to enhance your design. You will have the option to create a small trinket bowl and pendant, or two pendants.